Over the end-of-year break I read Jennifer Haigh’s 2005 novel, Baker Towers. This novel is about a family living in the fictional Bakertown, in the coal-mining region of Pennsylvania in the 1940s and 50s. Bakertown is named after the mine-owning family, the Bakers, and Baker Towers is the facetious name for two huge piles of scrap from the mines that dominate the landscape and pollute the atmosphere. Miners are paid partly in scrip, company-issued “money” that can be used only to buy goods at the company store. The father of the family risks being fired when he buys a stove from an independent businessman at a lower price than he would have to pay at the company store; it’s delivered in the middle of the night. The miners also live in company housing, so if a miner loses his job, his family becomes homeless. Many of the miners die of pulmonary diseases after spending their youth on their hands and knees in the tunnels, digging for coal. This novel reminds us of what conditions used to be like for miners in North America. It’s only a few decades since trade unions were able to obtain better conditions for men working in such arduous conditions. Yet many governments and corporations treat trade unions as enemies. The Canadian government has recently passed a law forcing trade unions to publicly reveal their officials’ salaries, yet it hasn’t passed a law forcing corporations to do the same. Michigan recently joined many other US states in passing so-called “right-to-work” legislation that is meant to undercut unions’ bargaining power by removing their right to make sure all employees at a company are members of the union. This may sound like a question of freedom but it pits members against non-members, making it much easier for employers to divide workers against each other. In South Africa, the last five months of 2012 were a period of miners’ strikes for higher wages. 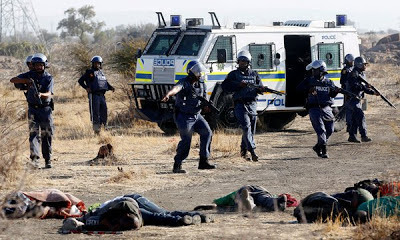 In at least one instance, police attacked miners and over 20 were killed. The new deputy leader of the ruling African National Congress, Cyril Ramaphosa, was a union leader during the struggle against apartheid. Now he is a multi-millionaire businessman who called for police action against the miners during the strikes, according to leaked emails (reported in The Economist, Dec. 22, 2012, p. 71). Ramaphosa is a far better option to take over South Africa after President Jacob Zuma retires than Julius Malema, the so-called “youth” leader convicted of hate speech for calling for “Boers” (white Afrikaaner South Africans) to be killed (Malema was expelled from the ANC). But it’s still very worrisome that Ramaphosa, a former union leader, should turn so quickly against miners asking for better pay and working condition. Meantime, the Canadian government has announced that the Canadian International Development Agency (CIDA) will be promoting partnerships between Canadian mining companies investing overseas and non-government organizations (NGOs). The idea is that NGOs have expertise that mining companies don’t have, in matters such as community organization. So the mining companies, conscious of the reputational risk of merely exploiting resources in less developed countries without doing anything to help the communities where they are based (and whose land they may be using) will be able to avail themselves of NGOs’ expertise in building schools, clinics, etc. But I’ll bet the one kind of NGO CIDA won’t be promoting as potential partners is trade unions. Trade unions possess expertise in organizing workers to demand their rights, including higher wages and better working conditions. Trade unions also know how to organize strikes. This is the kind of expertise the local miners working for Canadian companies really need but I doubt very much that CIDA will provide it. I’m not all that fond of Marxism after the horrors that so-called Marxist regimes have perpetrated in the Soviet Union, China, and elsewhere, but I still think the slogan “Workers of the world unite!” is a good one.